Elvis Presley not only portrayed Native Americans on film but was himself of Cherokee Indian ancestry, said English Professor Michael Snyder during “Elvis as Indian,” a presentation held on campus Dec. 9. Snyder presented the lecture, which was attended by a group of about 50 people. He pointed out that Presley was a great role model for Native Americans by playing admirable Indian roles in his films. Presley’s appearance as an Indian in these movies showed him as a figure of honor not only in the eyes of Native Americans but to others as well, he said. 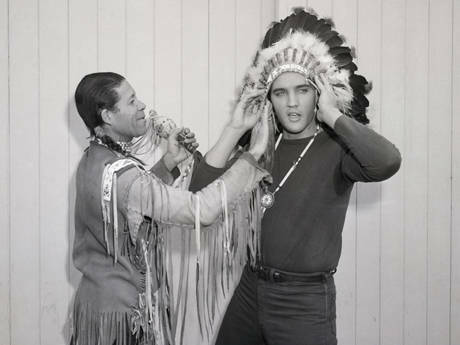 In 1960, after he played the son of an Indian woman and a white settler in his film “Flaming Star,” Presley was inducted into the Los Angeles Indian Tribal Council and honored by Chief Wah-Nee-Ota, a Creek Indian actor and musician from Muskogee, Snyder said.